The Starn twins’ evolving, slinky-like Big Bambú exhibit asks you to put on your rubber-soled shoes, leave the camera behind, and climb through the bamboo tubes for a birdlike experience overlooking Central Park. The installation evolves daily as the twins’ team of rock climbers add to this living piece of art. Time entry admission is required to climb, but everyone can admire otherwise. 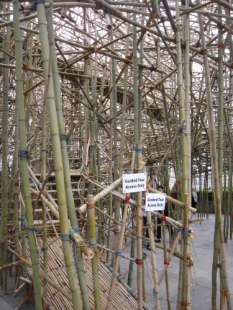 Big Bambú will be on display through October 31. Set in ten community parks throughout the five boroughs, artwork by students will be visible through September 30. Students have transformed school lunchroom tables into personalized canvases that reflect issues of concern in their communities. This is the largest student exhibition in the history of NYC Parks and the first to span five boroughs. A View from the Lunch Table is a product of LEAP, a non-profit organization designed to improve public education through an arts-based approach to teaching. Here’s an interactive exhibit designed to bring out the performer in everyone. Sixty upright pianos are placed in strategic location throughout the five boroughs. Visitors are encouraged to play throughout the day along with more formal concerts involving serious artists. Hurry, though, as this one ends July 5. 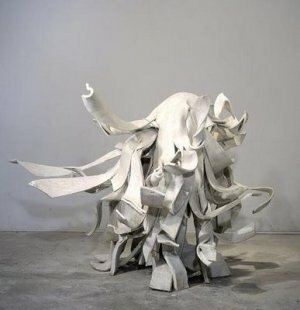 A white sculpture which incorporates the familiar bicycle lane insignia, Bike Guy becomes three dimensional. The choice of location, McCarren Park and neighboring Williamsburg, highlight the area’s increased dependence on the bicycle as a transportation alternative. The piece will be up for viewing through October 15. 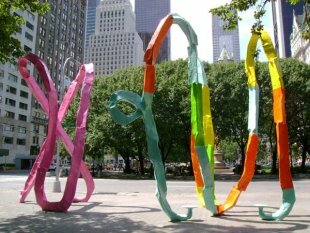 A project of the Public Art Fund, Franz West’s "The Ego and the Id" sits colorfully at the edge of Central Park overlooking the Plaza Hotel. Through August 23, visitors can admire the 20 foot sculpture’s colorful looping abstract forms, which curve in such a way that they create stools on which passerby can sit, reflect, and directly engage with the artwork. Located at Dag Hammarskjold Plaza in Manhattan, this is a collaborative project with the NYC Department of Parks and Recreation and the Friends of Dag Hammarskjold Plaza. Honoring Dr. Martin Luther King, the piece is a construction of cut and bent welded steel I-beams and will be on display through September 5. Presented by the Fund for Park Avenue Sculpture Committee with assistance from the Grand Central Partnership, the series of sculptures prominently set on the malls on Park Avenue between 52nd and 54th streets represent curving representations of the female body. Roosen’s training in dance continues to influence her art along with her involvement in the early days of the feminist movement. The pieces are made of stucco, offering mass with a concurrent sense of vulnerability, and will stay in place through August 28. Set in one of the city’s most offbeat sculpture parks, the outdoor Socrates Sculpture Park in Queens, the new show covers eleven new works by eleven artists. The show, by virtue of its outdoor setting, explores the presence of nature in the fabric of urban life. Contemporary issues and concerns in the social, political, economic and aesthetic realms relate to their immediate surroundings of grass, park, plazas, and wildlife. The show lasts through August 1. Through December 30 in Fort Greene, Brooklyn, a series of colorful birdhouses will be the centerpiece for a full program of education about birds, art, and ecology. Viewers can build their own bird house using supplies provided by the artists. This entry was posted on Friday, July 2nd, 2010 at 12:29 am	and is filed under Stuff to Do. You can follow any responses to this entry through the RSS 2.0 feed. You can leave a response, or trackback from your own site. I love the idea of “Play Me, I’m Yours.” Any idea if (and when) they will be bringing this back?? Thank you. Awesome submissions you got here. Got some extra sites to point to which have more info? EAch of NYC’s Museums has its own Web site with lots of helpful information.